Project ReNacer - Who Are We? Rev. Hasael Zecry Pacheco Rivera, born in Mexico City February 10, 1974, was called to the mission field when he was 24 years old. He went to Rio Grande Bible Institute (now seminary), to prepare himself for God's work in Mexico. During that time he met and married Misty R .Brown. Hasael graduated with a Bachelor of Arts in Christian Education. He has also graduated with a Masters in Hispanic Ministries from Edinburg Theological Seminary. Hasael has worked in various ministries and also has worked as a pastor at Belen Baptist Church in Weslaco, TX. He worked for Plain Gospel Mission in Galeana, N.L. Mexico for 1 year. 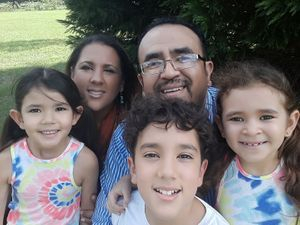 There he was called to work in Santiago de Querétaro, México and has been there for the past 7 years serving as the pastor for the church that God has planted there. Misty Renee Pacheco (maiden name Brown) was born in Houston, TX October 9, 1980. She was adopted by Wayne and Carolyn Brown whom as well are missionaries in Mexico. They work for Plain Gospel Mission in Galeana, N.L Mexico. She has always been involved in missions; from vacation bible school to translating for mission groups. She started school at Rio Grande Bible Institute (now seminary) where she met and later married her husband Hasael Z. Pacheco Rivera. She has 3 children with him; Mikail (13), Lorienne (8) and Hazel (7). At the moment her ministry is having music workshops in churches that ask for her help and is music director at the church where Bro. Hasael serves as pastor. Mikail Miudopha Pacheco Brown is the eldest son of the Pachecos. He is 13 years old and is in the 7th grade with Abeka Academy. He enjoys drawing and helping his mom at church with the sound system and projection. He wants to go to Liberty University when he graduates from high school. His after school activity is Tae Kwon Do. Lorienne Kenisha Pacheco Brown (right in picture) is the Pacheco's middle child. She is a very energetic 8 year old that is in 2nd grade with Abeka Academy. She loves playing with the kids at church and with her brother and sister. She is also learning to play the drums and loves gymnastics. Hazel Roschelle Pacheco Brown (left in picture) is the Pacheco's youngest child. She as well is a very energetic 7 year old that is in 1st grade with Abeka Academy. She also enjoys playing with the kids at church and her brother and sister. She absolutely adores Peppa pig.